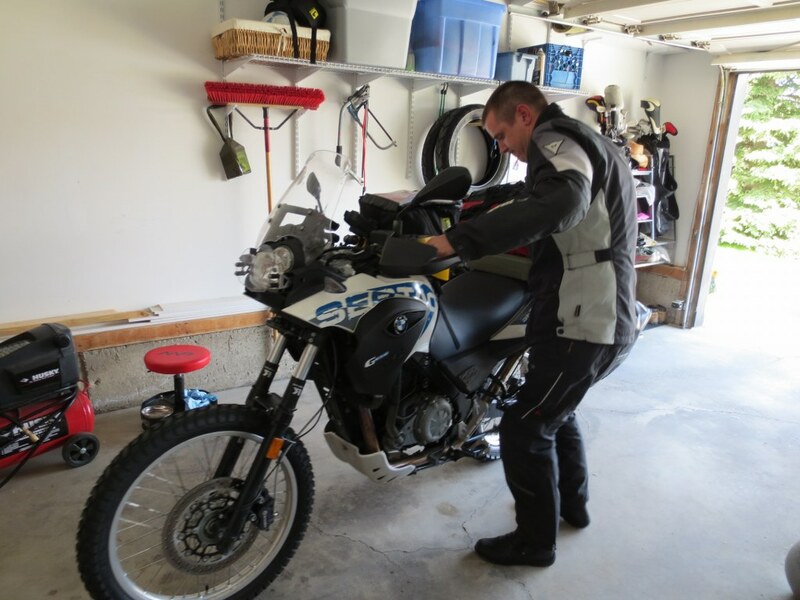 Posted in: Motorcycle to Tuktoyaktuk. In my frenzy to get packed up and on the road I noticed the incriminating pool of oil returned under my bike. This time it was clear and obviously new oil leaking from somewhere on the bike. I don’t have time to do anything about it and figure I would continue to monitor it on the road. First the Oil leak, now the front fender. I cant ride up north on dirt roads without a front fender so I’m starting to believe this trip just may not get going. 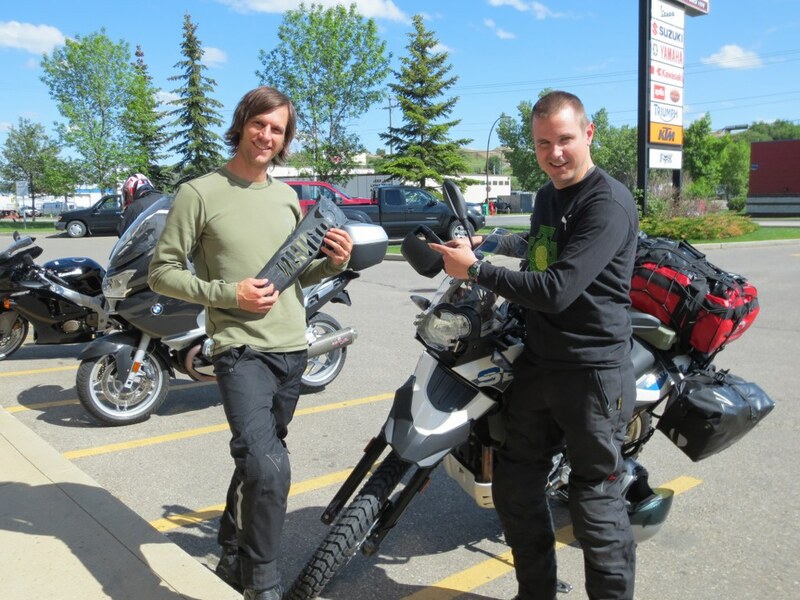 We drive down to Blackfoot and talk to the parts guys – 7 days to order a new part. 7 Days waiting on a part would consume almost half of my available time. They inform me there is nothing I can do but wait. I just purchased my bike at Blackfoot and know they have a number of Gs in the showroom. I figure why not just harvest a part from one of those. The parts guy assurs me that it is just not possible, actually it was “absolutely no way” was how he put it. Determined to get this resolved I go off to find my sales guy. After explaining my situation and pleading with him he leaves to go see what he can do. My whole trip is hinged on whether or not he will go out of his way and do me a favor. Based on my recent dealings with BF I was not optimisitc. A few minutes later he comes back and says “go pay for the part and we’ll take a front fender off the one of the showroom bikes”. NICE! I’m unbelieveably apprceciative of this. There is a reason some people are in sales and some are not, if I left after speaking to the parts guy, I would never go back to Blackfoot, but the sales guy knew the long term benefits of making it right and helping a customer out – nice work! We hit the road dripping in sweat, but as soon as we hit the mountains the conditions change. In typical rocky mountain fashion the weather takes a sudden nosedive. At this point I just want to get out to Jasper without burning any more daylight. We stop in Lake lousie to gas up and I notice my boot and leg are covered in oil. It appears that small oil concern I had has turned into a major issue. I start the tear down to find the leak tracing it back to the oil reservoir. The obvious places are bolts that Blackfoot would have removed as part of the oil change. I put a wrench to the bottom drain plug and it was tight. I put a wrench to the upper oil reserve tank and it was ready to fall out. My felling of anger towards Blackfoot service, quickly turned into joy for finally finding the oil leak. It was like a pebble in my shoe, I was trying to ignore it, but I knew it was always there. 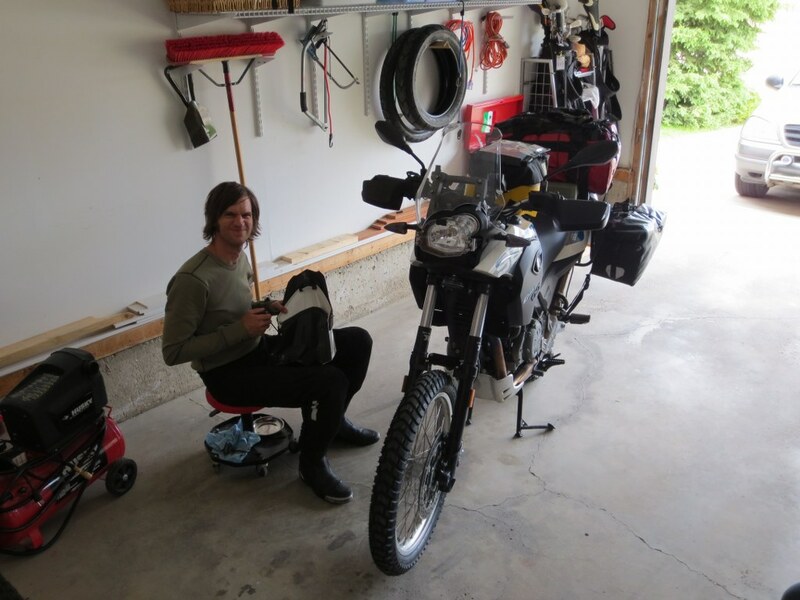 We put my bike back together and head towards Jasper. 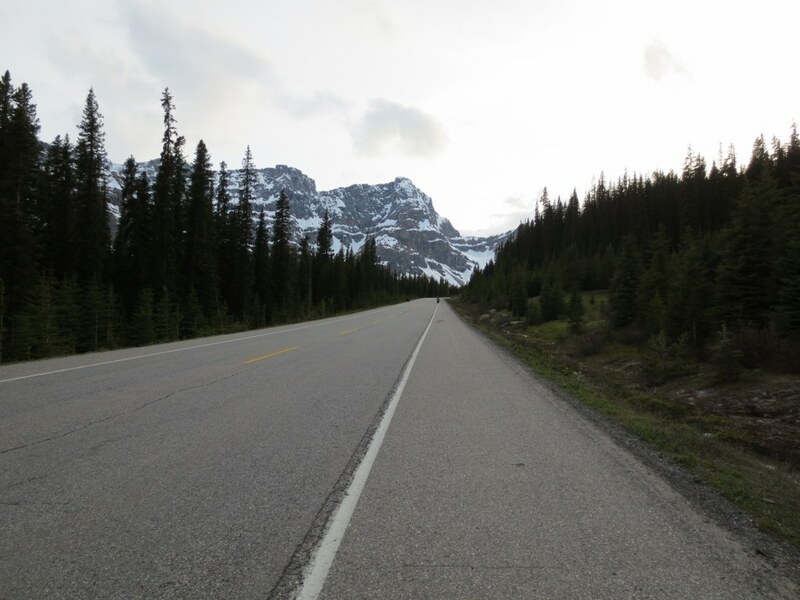 The ride from Lake Louise to Jasper was cold, every shiver down my spine transferred down my arms and gave the bike a bit of a wiggle. 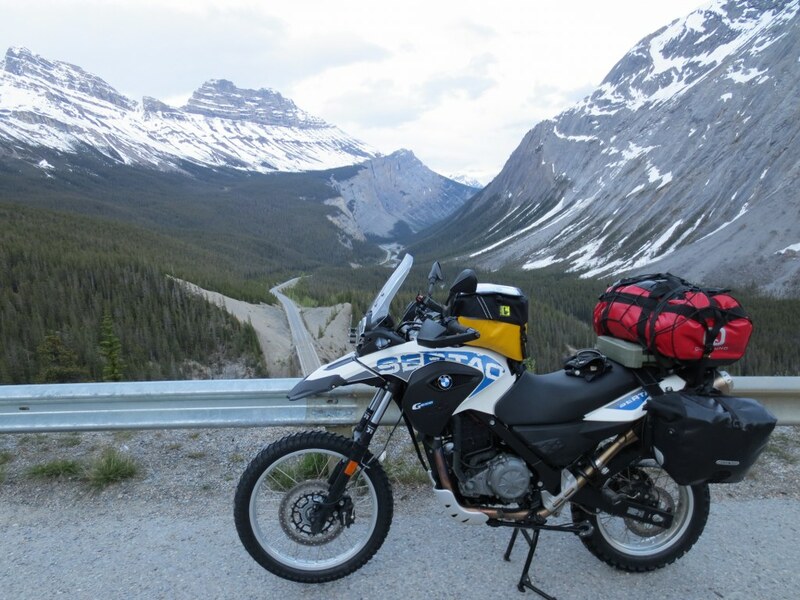 The scenery was world class, amazing ride, even saw our first wild life – a little black bear. 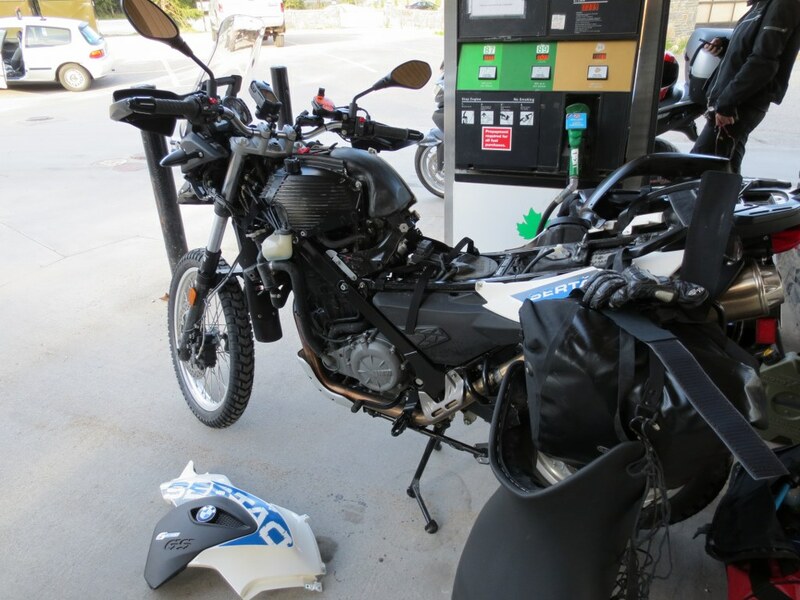 but the bike is designed to be filled while on its side stand, I probably got 2-3 liters less than I thought. I had extra gas in my pack, but it was cold and getting dark and I had little desire to stop, unpack my gear and fill my tank. I made it to Jasper and filled up after a great meal with John, Robin and Edward. O my, hard way to start – the worst has to be behind you now, nice work for sticking with it. Just checked your GPS location – Hello YUKON!